Geochemistry and Stable Isotope Geochemistry. The EU program BONUS will fund our project ECOMAP (start 1st of September 2017). The goal of ECOMAP is to develop innovative methods for improved remote sensing of the seafloor in the Baltic Sea, especially addressing the physical impact of benthic life on the sensing procedures. We propose new measurement techniques and a catalogue detailing new procedures on how to implement remote sensing methods for selected habitats. 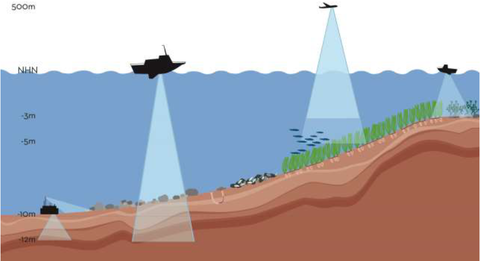 Our objectives are (1) to test the feasibility of adapted shallow seismics, modern hydroacoustics, customized in situ laser methods and state-of-the-art airborne lidar to remotely sense habitats such as seagrass meadows, reef-building macrofauna and stone reefs, as well as shallow gas areas, which are all indicators of ecosystem diversity and health, (2) to develop and merit full waveform analyses for both, SoNAR and LiDAR, (3) to increase the available data dimension by multi-frequency and multi-angle approaches, (4) to develop algorithms and computer machine learning tools to investigate benthic life (5) to develop ground-truthing, calibration and in situ methods to investigate the relation between opto-acoustic facies and marine habitats, and determine the natural variation of the seabed. ECOMAP will highly contribute to better understand linkages between opto-acoustic and biological facies and geological models, and will provide a more comprehensive and holistic view on the seafloor. The project will deliver case studies valuable for the emerging market of environmental monitoring and spatial planning, and will support companies and stakeholders to recognize assets and drawbacks of latest technology. Overview of the acoustic and laser remote sensors and habitats to be investigated in ECOMAP. Carrier platforms are shipvessels, in situ monitoring devices on the seabed, and aircrafts. Aim of the present study is the detection of small structures and objects on and in the sediment using ultra-high-frequent acoustical and optical techniques. The resolution should be in the nrange of centimetres or better. Additionally 3D volumes will be spatially imaged.